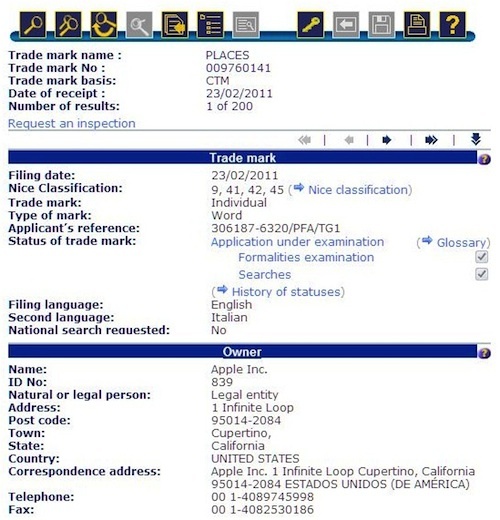 Apple Files for 'Places' Trademark Ahead of MobileMe Revamp? As noted by Patently Apple, Apple has filed for a European trademark on the term "Places", potentially hoping to utilize the term as part of a revamped MobileMe service offering social networking and geolocation features. Earlier today, Apple discontinued its boxed version of MobileMe and removed the service from its online store, suggesting that a rumored transition to a revamped free service may occur in the relatively near future. While Apple already utilizes a "Places" feature within its iPhoto application to allow users to find geo-tagged photos by where they were taken, the new trademark application seeks protection in several classification areas, including GPS-related social functions. "Places" is of course already the name of a Facebook feature that allows users to "check in" at various locations, and it is unclear whether Apple will run into difficulties with its own trademark applications given the potential close similarity to Facebook's use of the same term.